MOSCOW (Sputnik) - As many as 51 percent of French nationals are dissatisfied with the media coverage of yellow vests protests in the country, a Kantar poll showed on 24 January. Thirty-two percent of respondents, in contrast, positively assessed the coverage, according to the pollster's trust barometer. Meanwhile, 67 percent of the French were convinced that media were overdramatizing the events. A total of 52 percent believed that people with hard-line views were too frequently given a platform to speak up. The poll was commissioned by La Croix newspaper, with no data on the poll’s dates and the number of respondents available. 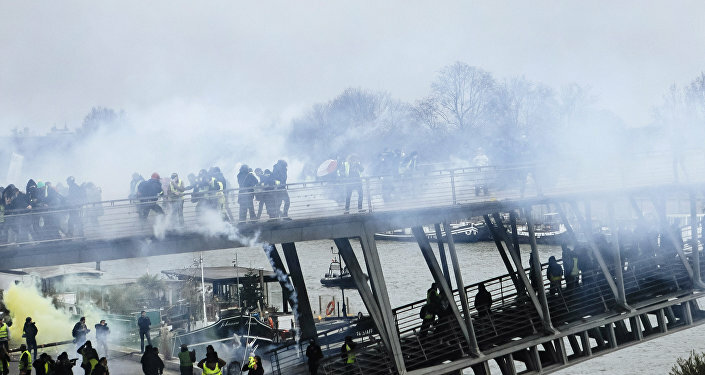 The wave of the so-called yellow vests protesters — named after the obligatory attribute of French drivers — started in France in mid-November. The French government has scrapped its planned hike in diesel taxes that sparked the protests and introduced a number of measures to resolve the nation's economic and social crisis, but the yellow vests have since morphed into a broader movement against government policies and rising living costs.